100% organic product made of pine. 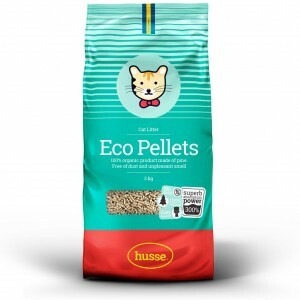 ECO Pellets are made of Pine fibre, which is an excellent natural antiseptic. The product is environmentally friendly without any harmful additives. The superb absorption power (300%) makes this product very economic. Used litter can easily be flushed down the toilet and does not clog sewer pipes. The litter tray system has two sections. The upper part has a grating in the bottom. On this grating and in the lower section of the tray you put ECO Pellets up to 2cm. When the cat urinates, 90% of the urine passes through the grating, falling to lower section of the tray. The rest of the cat urine is absorbed by the ECO Pellets which is affected and falls apart into sawdust. The natural behaviour of scratching by the cat helps the sawdust to fall through the grating. You only need to throw away the sawdust that falls into the lower section. The only slight smell is of wood. No smell of cat urine can be scented. The cat’s paws are always kept dry. 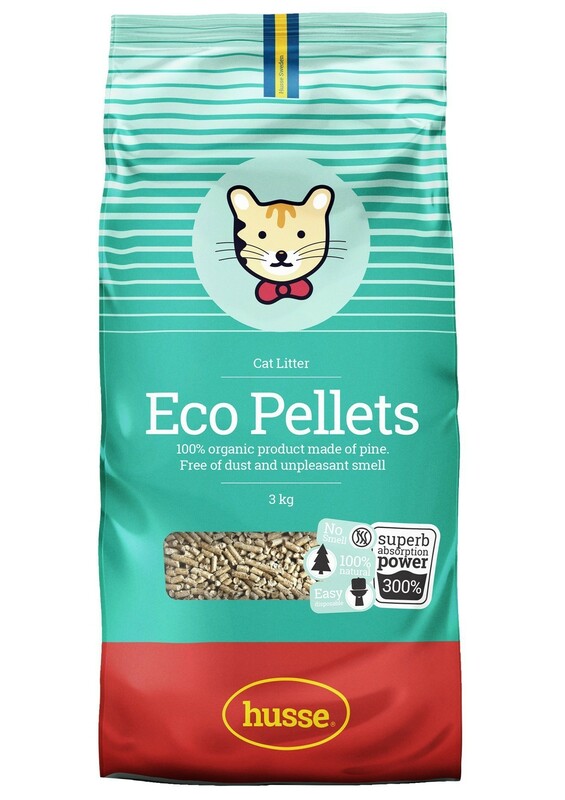 The superb absorption power (300%) of ECO Pellets make the use of the product very economic and ensure that you cat’s paws are always dry. Clean the lower section of the tray regularly. Shake the tray a little before emptying so any remaining saw dust in the upper section will fall in the lower section before you clean it. Every now and then remove the top container and rinse it. Add cat litter up to the 2cm mark in the top container every day. Mix a small amount of ECO Pellets in your usual cat litter and gradually increase the amount each time you clean out the litter tray. Start using the lower section of the ECO Pellets tray. After a week, the cat will get used to the new cat litter, then you can start using the tray and ECO Pellets normally. Use a bit of soft toilet paper to mop up the first few drops your kitten makes which are usually outside the tray and put the paper on top of the cat litter in the litter tray then bring your kitten to the tray. Repeat the procedure a couple of times. Be consistent. After few days, the cat will learn by recognizing the urine smell that the cat litter tray is the right place to pee. Fill a dry Husse grid tray with a 2 cm layer in the top container and the lower section with a 1 cm thin layer. Clean the lower section of the tray regularly. Shake the tray a little before emptying so any remaining saw dust in the upper section will fall in the lower section before you clean it. If you have previously used another litter, switch your animal to Husse pellets gradually by mixing the old and the new litter the first couple of times. It will make it much easier for animal to get used to the new litter.